Transformers are used to increase voltage before transmitting electrical energy over long distances through wires. Wires have resistance which loses energy through joule heating at a rate corresponding to square of the current. By transforming power to a higher voltage transformers enable economical transmission of power and distribution. Consequently, transformers have shaped the electricity supply industry, permitting generation to be located remotely from points of demand. All but a tiny fraction of the world’s electrical power has passed through a series of transformers by the time it reaches the consumer. Transformers are also used extensively in electronic products to step-down the supply voltage to a level suitable for the low voltage circuits they contain. 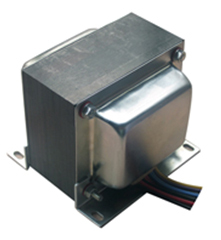 The transformer also electrically isolates the end user from contact with the supply voltage. Signal and audio transformers are used to couple stages of amplifiers and to match devices such as microphones and record players to the input of amplifiers. Audio transformers allowed telephone circuits to carry on a two-way conversation over a single pair of wires. A balun transformer converts a signal that is referenced to ground to a signal that has balanced voltages to ground, such as between external cables and internal circuits. 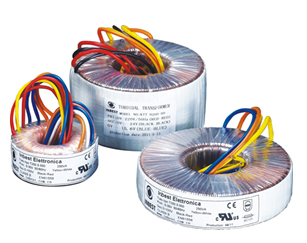 Toroidal transformer have become a preferred technology over laminated units for many industries and applications. Scientek transformers can serve in all of these applications and many more. Doughnut shaped toroidal transformers are used to save space compared to EI cores, and sometimes to reduce external magnetic field. These use a ring shaped core, copper windings wrapped round this ring (and thus threaded through the ring during winding), and tape for insulation. Toroidal inductors and transformers are passive electronic components, typically consisting of a circular ring-shaped magnetic core of high magnetic permeability material such as iron powder or ferrite, around which wire is coiled to make an inductor. Toroidal coils are used in a broad range of applications in AC electronic circuits, such as high-frequency coils and transformers. An inductor with a closed-loop core can have a higher magnetic field and thus higher inductance and Q factor than similarly constructed coils with a straight core (solenoid coils). This is because the entire path of the magnetic field lines is within the high permeability core, while in an inductor with a straight core the magnetic field lines emerging from one end of the core have a long air path to enter the other end. In recent years, the use of toroidal (donut) shape cores has increased greatly. The advantage of the toroidal shape is that due to its symmetry the amount of magnetic flux that escapes outside the core (leakage flux) is minimum, therefore it radiates less electromagnetic interference (EMI) to nearby circuits or equipment. EMI is of increasing importance in modern low power, high frequency electronics. A side effect in torus-shaped inductors is that, because the winding surrounds the central hole and the current traverses the winding in a circular direction, there is a weak poloidal magnetic flux that threads the "donut hole" in the center of the torus, in addition to the main toroidal flux direction parallel to the core of the torus.